All measures of programming language popularity are indirect and controversial. There’s no consensus on the best way to measure popularity, even if we could gather any data we want. Still, measures of popularity based on data, especially combining several kinds of data, are more useful than personal impressions. 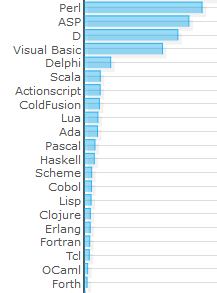 According to the normalized comparison chart on langpop.com, at the time of writing this post, D is easily more popular than all functional programming languages combined. Here’s a portion of the chart zooming in on D and functional languages. This hardly seems possible. As I stated up front, all measures of programming language popularity are crude proxies for what we’d really like to know. But still, this says that by at least one measure, D is more popular than any functional language. The langpop.com site lets you twiddle the weights assigned to different components of the comparison. And for a wide range of weight choices, D comes out ahead of any functional language. My preference would be to set the Google Files component should be zero since it’s only looking at web page languages. (The page won’t let you set a component to exactly zero, but you can make it tiny, say 0.001.) Github stats give you a good view into the open source world, but it would be an example of availability bias to assume the whole world of software development looks like Github. Craigslist might be a good window into commercial software development.